"Fragile Allegiance is an open-ended 4X real-time strategy (RTS) game from Gremlin Interactive, released in 1996 for MS-DOS and Windows 95. It begins on 25 May 2496 as the player begins their employment with TetraCorp (a large interstellar megacorporation) who have set up a new asteroid mining franchise operation in the Fragmented Sectors. There are 6 alien races competing with Tetracorp for these resources. Beginning with one building and one million credits, the player is tasked with building up a successful mining operation to sell as much ore as possible to the Federation. Diplomacy is crucial to the success or failure of this franchise operation as the players' colonies begin to encroach on one another. The game features complex diplomacy between players and includes real-time lip-synced animations for in-game actors. Described as a combination of SimCity 2000, Civilization and Risk,Fragile Allegiance uses an icon based GUI for all menus and game commands. Unlike other RTS games, there is no defined tech tree, with technology being unlocked by the purchase of 36 blueprints at any time during the course of the game. 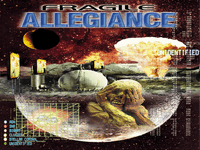 Fragile Allegiance is the spiritual successor to K240 and there are many similarities between the two. Fragile Allegiance generally scored well with reviewers, with PC Gamer UK giving the game the "Game of Distinction" award and it was praised for its graphics, interface and sound.The game has problems running on Windows XP,as it was designed for MS-DOS and ported to Windows 95." Source: Wikipedia, "Fragile Allegiance", available under the CC-BY-SA License.